Many people snore. In fact, according to the American Academy of Sleep Medicine, there is a 50-50 chance that you will snore at some point. But if your loved ones regularly tell you that you snore loudly and sound like you’re in distress, you may have sleep apnea. At Meadows Dental Group, our dentists have experience helping patients who struggle with the standard treatment for sleep apnea. Call our office in Lone Tree, Colorado, at 303-790-2323 today to schedule your appointment. We welcome patients in and around Highlands Ranch, Centennial and other nearby areas. Patients with sleep apnea briefly stop breathing when they’re asleep. These interruptions can happen hundreds of times a night, which diminishes the restfulness of your sleep. There are two kinds of sleep apnea: central sleep apnea, which occurs as a result of miscommunication between the brain and the body, and obstructive sleep apnea, which occurs when soft tissues in the airway reduce the flow of air. Patients with sleep apnea commonly feel tired during the day, even after getting a full night’s rest. They may be irritable or moody. They may also sound like they’re choking or gasping for breath when they sleep, in addition to pervasive snoring. CPAP is not the only option. Our dentists can help! The most common and, from a clinical perspective, effective way to treat sleep apnea is a continuous positive airway pressure (CPAP) device. Patients wear a face mask that maintains a steady flow of air, which combats snoring and regulates breathing. Patients with untreated sleep apnea are at an elevated risk for high blood pressure, which in turn increases the risk of heart attack and stroke. So, if you’re having trouble adjusting to CPAP after your doctor diagnoses you with sleep apnea, Meadows Dental Group is here to help. 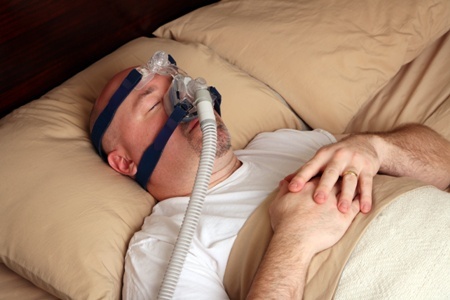 Patients who are unable to tolerate CPAP treatment may benefit from oral splint therapy. Our dentists will evaluate the position of your jaw and create a custom oral appliance. Similar to TMJ treatment, this appliance repositions your jaw. Maintaining the optimal jaw position will keep your airway open during sleep, thus preventing the disruptions to breathing caused by obstructive sleep apnea. The splint is worn like a mouth guard, making it much more comfortable and less obtrusive than a CPAP device. The likelihood of you unconsciously removing the appliance while you sleep is also much lower than patients with difficulty tolerating the mask or hose. It is important to note that a medical doctor who specializes in sleep medicine should diagnose you with sleep apnea before you visit our office. Our dentists have extensive experience helping patients find the best option for their dental health and overall well-being. Dr. Scott Peppler has completed advanced courses in appliance therapy for sleep apnea. Call 303-790-2323 if you are struggling with sleep apnea and want to get a full picture of your options. Meadows Dental Group is located in Lone Tree and serves Highlands Ranch, Centennial and other areas of Colorado.